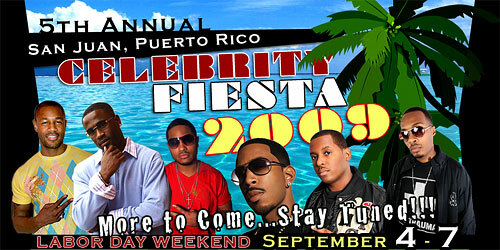 The 5th annual Celebrity Fiesta will take place Labor Day Weekend (Sep. 4-7, 2009) at El San Juan Hotel and Casino. A fantastic hotel which is part of the Waldorf Astoria Collection. Located in the Isla Verde district of San Juan, Puerto Rico – 15 minutes from the shopping, entertainment, and history of charming Old San Juan. Minutes from fine dining, renowned attractions, and hot nightspots. A short distance from Plaza Las Americas, the Caribbean’s premier shopping mall. Five minutes from Luis Muñoz Marin International Airport (SJU). This event is geared towards the mature crowd who love to relax as well as play. A host of celebrities are expected to attend including Tank, Sammie, DJ Self, DJ Trama and the beautiful KD Aubert.